To explore deeper in the list of Magento 2 themes from our partner's post on Everything you need to know about Magento, today we are presenting various themes for you to check. Here is the list of premium Magento 2 themes with great authority, selected from Magento Marketplace, Themeforest and TemplateMonsters. As a store owner, you can use this list to make a decision on which Magento theme you want to purchase. Our comment: Clean and light design. Smooth animation. Fast loading. The recently viewed product is quite rare. Very reasonable price. Our comment: Bold Menu font and heavy-weight icon-set make this theme looks a little bit over-emphasized. No demo available. Our comment: A high-class theme with multiple features. Flat modern design. Our comment: Pearl is the theme from the top player in the category of high-class themes. It supports multiple powerful features with elegant design and smooth user experience. Our comment: Rope is the multi-purpose theme that emphasizes sleek and slim design. It has good use of animation. For a theme with all these features, Rope's price is quite good. Our comment: Couture Fashion is a Magento 2 theme that gears towards modern clothing and fashion brands, modeling agencies. That might be the reason that Couture has such a beautiful design and smooth animation in various sections. The features are moderate for a theme in the middle-class segment. Our comment: Instagram is a Magento 2 theme in the low-class segment. The theme was made for fashion store, gift shop, clothing store, any fashion industry related project. The design use various full-sized images to create a highly-visual feeling in customers. Our comment: Vini is a Magento 2 theme in the middle-class segment. The theme has a dark overall design with black as the elementary color, and white as the secondary color. Claiming to target fashion vendors, the theme tries to follow an artistic concept in website design. However, the features this theme provide is decent for an online store. Our comment: Argento is a long-standing theme in the high-class segment. The theme's design follows 3D style in various sections such as header, footer, or product tabs. The features are strong and comprehensive. Our comment: Albedo is a theme in the middle-class segment, well-made for Audio stores. It has a wide range of features from Mega Menu to AJAX Search. Our comment: Delcoman is a theme in the middle-class segment, gears towards lingerie stores. The design and layout is clean, making it easy to portrait the most beautiful products. 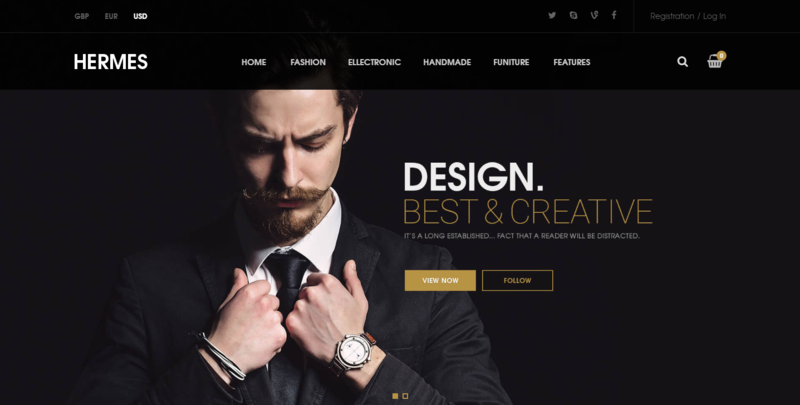 Our comment: Jewelrus is a Magento 2 theme made for jewelry stores. It has a clean and elegant design, using back and white as the main colors. Enjoyable to browse. Our comment: Stereocar is a Magento 2 theme made for car-audio stores, in the middle-class segment. It has a clear and eye-catching design with red, black and white are the main colors. Our comment: Articon is a theme for art galleries. Fine art store owners can easily showcase and sell their product using this theme. It has a clear design and fast animation, and a fine set of features included. Our comment: BigHunt optimizes its design for fishing and hunting gear stores. This theme makes use of various banner sliders on the homepage, making store products easy to find. It has a quite good set of features. Our comment: Yangxin is a Magento 2 theme in the middle-class segment that gears towards Chinese Restaurant stores. It uses red as the main color to stimulate user's hungriness. You can be very hungry to comment on this theme before lunch. Our comment: BuzzSport is the theme for gym gear store owners. Choose it if you want your customers to stay in shape! Like other Zemez's theme, it offers a wide range of functions. Our comment: Berguard is the theme for Office and Stationery supplies. The design is friendly and modern, making choosing office goods easier and more favorable. Our comment: FlyCross is the theme for drone sellers. The overall design is quite good, however, it still lacks the blank spaces. Fast animation. Our comment: Polasmos is another Fashion theme for Magento 2. Products are showcased artistically on the homepage, with different layouts for different products. Our comment: Ketondo is the office supplies Magento theme. It has a decent design for several office and home machines. This theme is well-designed and includes basic animation. Our comment: BooksID is the theme for bookish. The book geeks surely would love this! This theme has a light style, and the default CMS blocks are easily reusable. Our comment: MyGym is the sportswear theme, designed with both fashion and sports in mind. This theme has a basic design and animation. Our comment: Reflego is the theme made for Home Décor and furniture. The color palette used focuses so much on the green color, which, in our opinion, is not very suitable for this type of store. Our comment: Audionica is the theme for audio devices. You can sell all your headphones, speakers, and even microphone with this theme. The design is basic without much complexity. Our comment: Teethoc is the dental instruments Magento theme. Store owners who sell goods to dentists can make use of this theme. The design is straightforward with some animation. Our comment: Ultimo is one of the best-selling themes of all time, which enters the market of Magento theme pretty early. The theme provides comprehensive configuring options for store owners, making the theme extremely flexible. The theme is also well-documented with a very long user guide. It also has 8 demos and easy import function to deploy demos to your website. Our comment: Porto is also a giant in the Magento theme market. The theme provides 21 different demos for users to choose, and a wide range of selection for certain web's layout, header and footer style, and color and font. The speed of the theme is fast, making it seem light to customers. Our comment: Market is a Magento 2 theme developed by Magentech, that has 20 demos. 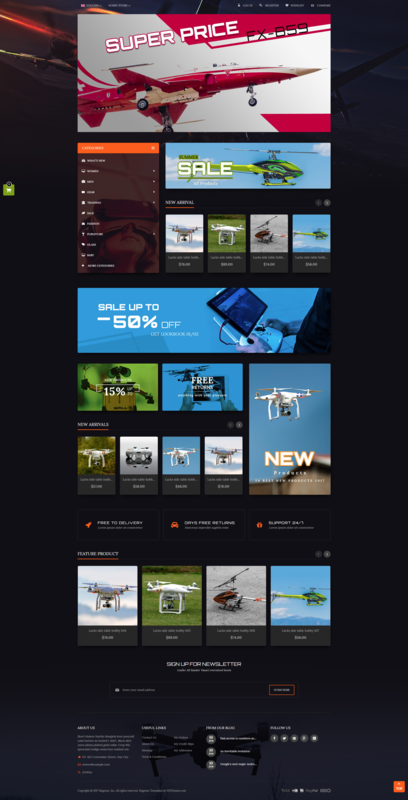 The theme is known for including strong features such as the ones stated above, as well as RTL support, hot deals products, sticky menu… Online marketplace owners can expect this theme to be favourable as it is also compatible with multi-vendor extensions. Our comment: Fastest is a Magento 2 theme by Codazone, that offers 20 demos directed to stores in 20 different industries like food & drink, sportswear, handbag, outdoor store. This theme also offers a lot of features with a very competitive design in the middle-class segment of Magento 2 themes. Our comment: Black&White is a Magento theme that does not limit its color palette to black and white. This theme provides only 1 demo with powerful features: a wide range of color, header, footer, and a lot of AJAX features. Our comment: EVERYTHING is a Magento theme that contains 20 demos which gears towards e-commerce websites working in 20 different industries. It also contains a lot of extensions inside that make it competitive at the price of a middle-class theme. Our comment: Maxshop is a Magento 2 theme that provides 9 demos at a competitive price. The features the theme offers includes hot deals, search box pro, and Rich Snippet. Our comment: Love Fashion 5 demos in Magento 2 version. The theme optimizes its design to fit fashion stores, clothing store, apparel, mall shop. It also offers multi header styles. Our comment: Luxury is the Magento theme that offers front-end builder (for Magento 1). This makes configuring the theme in the admin extremely easy. The theme also has multiple header and footer options for users to freely browse. Our comment: Unero is the Magento 2 theme that is full of easy configuration options. Its design is minimalism-oriented, making the appearance of the theme lean and straight-forward. The theme's function is undoubtedly powerful. Our comment: Molly is the Magento theme that offers a strong front-end builder (for Magento 1). You can be assured that configuring the theme in the admin extremely easy. There are 4 headers and 2 footer options. Our comment: Supermarket is the multipurpose theme that includes 6 demos and 4 header options. The theme has several configurable options in the admin panel, which gives the admin the power to change multiple elements of their web design. Our comment: Bencher is the theme that contains 8 demos and 6 header styles. The design of this theme is elegant and grid-oriented. There are also social channel support features inside this $84 theme. 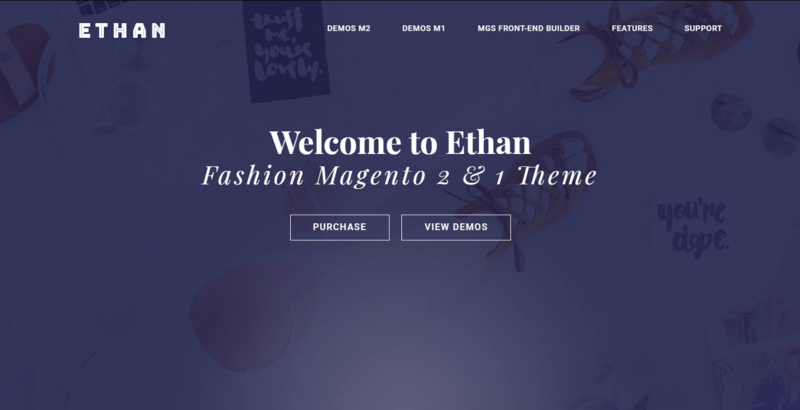 Our comment: ETHAN is a Magento theme that is optimized for Fashion theme. It has a good number of demo and a drag&drop system for configuring CMS blocks. Aside from that, there are various header and footer options. Our comment: Hermes is a theme with premium design, making use of both dark yellow and black color. The design looks extremely exquisite, and the animation is smooth. However, there are still small bugs. Our comment: Furnicorn focuses on furniture stores. 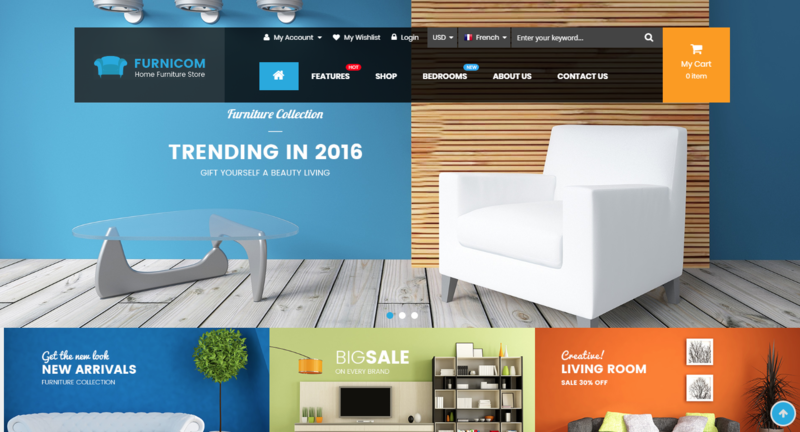 It has a design that creates a warm feeling, which is necessary for a furniture online store. This theme has good design and animation. 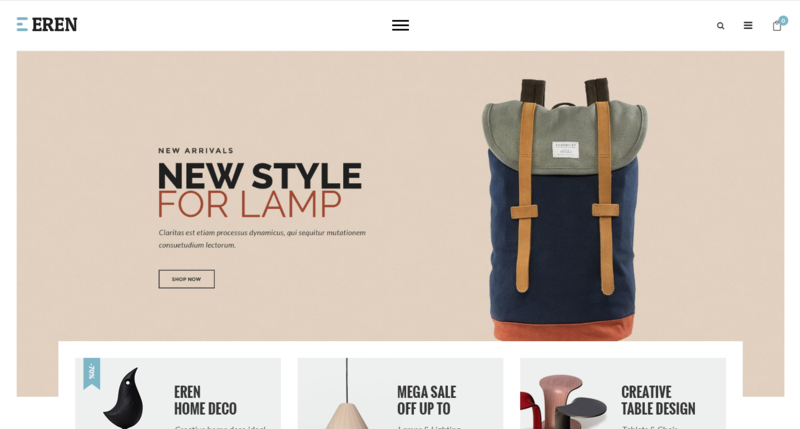 Our comment: Eren is another Magento theme that is primarily used for fashion stores. In this theme, you would find meticulous design backed with strong some common features and great support team. 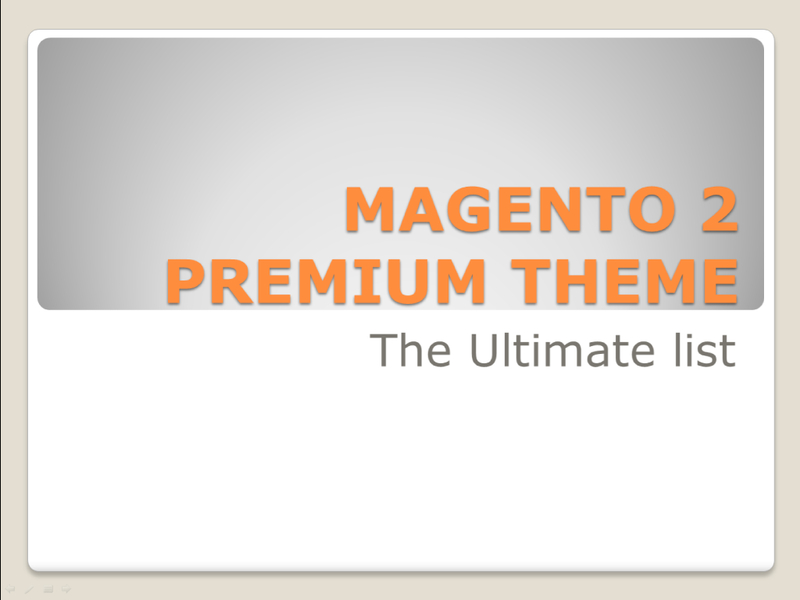 So that's the Magento 2 theme Ultimate list. Do you have any theme that you want to add to this list? Let us know in the comment below!